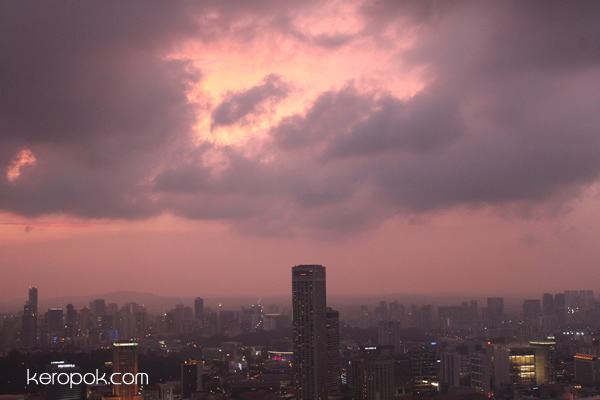 This was taken Tuesday evening at around 7:40PM. The sky was looking different, sky's reddish and my mind ran wild. There must be a hidden alien spaceship out there. There was a bright part in the clouds. Which also makes me wonder, how will aliens power their spaceships. Nuclear power? Hmm..
ArtScience Museum from the top. I happened to be at a very tall building just beside the ArtScience Museum. I could not resist not taking a photo of it again. I took and posted a photo of it once here. So that's where the lights are placed. It produces such a nice glow to the so called 'lotus' leaves. Rainwater is harvested and channeled down the big 'sink plug' you see in the photo. Part of that water is used in their toilets. I have not been in there, but I want to go there one of these days before the current exhibition ends. 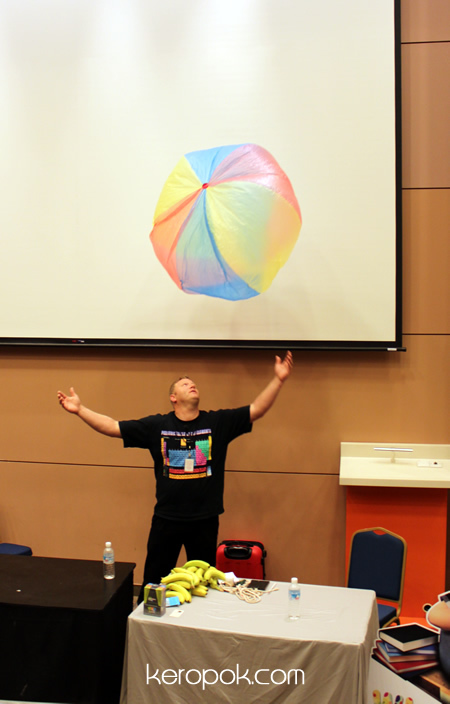 The Singapore Science Festival 2011 is back again! If you have not been attending the Science Festival, it's an annual event that celebrates the dynamism of science, engineering, technology and biomedicine. 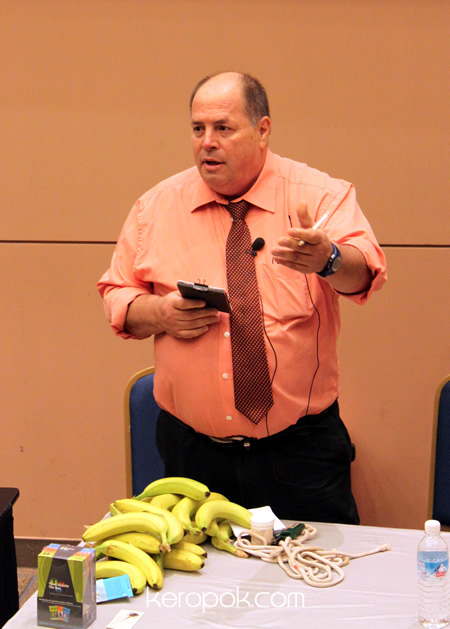 It's organised by the Science Centre Singapore and the Agency for Science, Technology and Research (A*STAR). One of the interesting part of the Science Festival is X-periment! 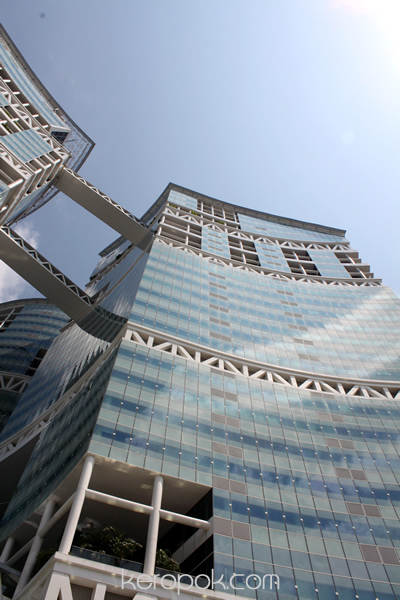 where the latest innovations and research by Singapore's research and tertiary institutions are featured. I was there last year at Marina Square for X-periment, were you there too? I was a triple science student and these science and geeky stuff intrigues me till today! 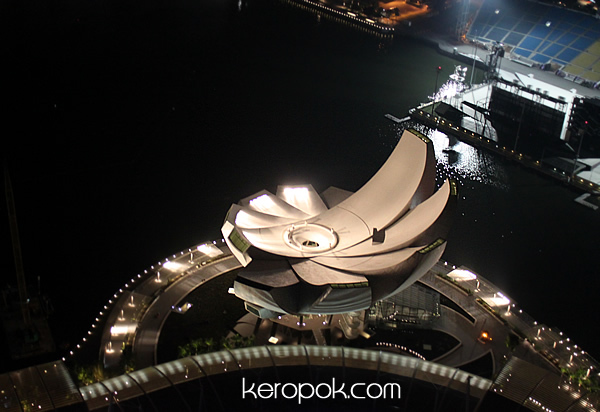 Talking about Marina Square, don't you think it was getting too crowded the last few years? The organisers seems to notice it too and this year, the Singapore Science Festival will be at the Suntec Convention Hall 401 from 22 to 28 July. There are also satellite events from 23 July to 13 August. X-periment! is on tomorrow and this weekend! Go check it out at Suntec Convention Hall 401. This year I had a special preview of the event yesterday. We saw this American Science teacher which also happens to be a Science Entertainer performed for us. He name is Jim Lenz. What a cool science teacher! How I wished my science teacher was as entertaining as he was when I was a kid! He performed some magic tricks and all of us were so intrigue. Either he was very fast, or I was distracted by his t-shirt that was the periodic table! He did some science experiments and even showed us how to make instant ice cream using materials that we can get easily. He also showed us how to make instant ice cream with a fire extinguisher! I am not sure if he will demo it during the Science Festival, but go down to Suntec Convention Hall 401 this weekend probably to take a look! If you want to see what he did, visit the Science Festival Facebook page. A video of what he did has been posted up! At the preview, we also met Yarin Kimo. He is a expert in the field of creative thinking. 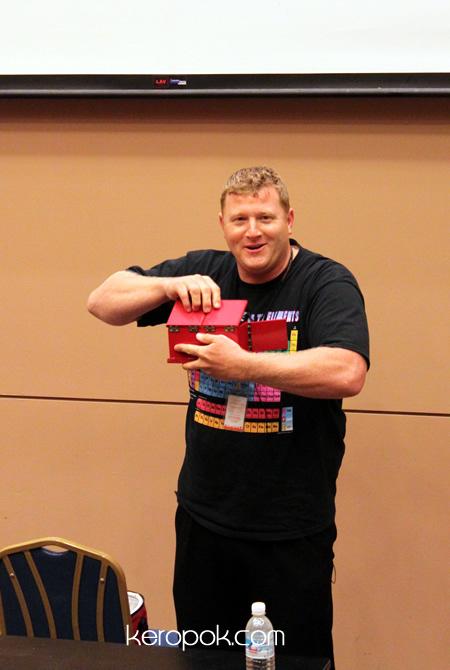 He uses magic tricks to demonstrate how to think differently and constantly develop new ideas. He performed some experiments that left us so curious how he did it. He said he won't reveal to us, but will disclose the answer during the festival. The robes on the table, it was used to cut through himself! Intriguing! Watch him do it at the Facebook page too! 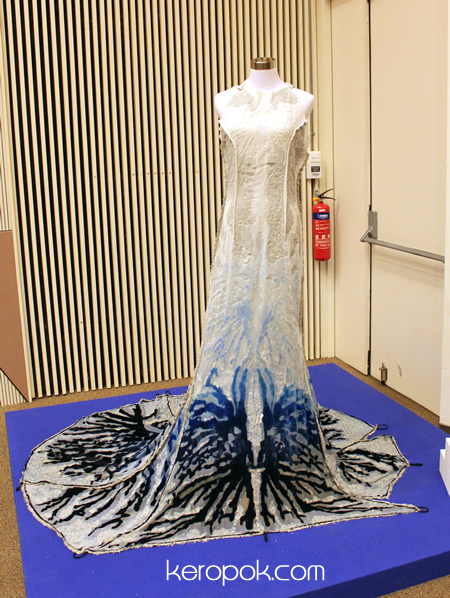 Heard of a air-purifying dress? 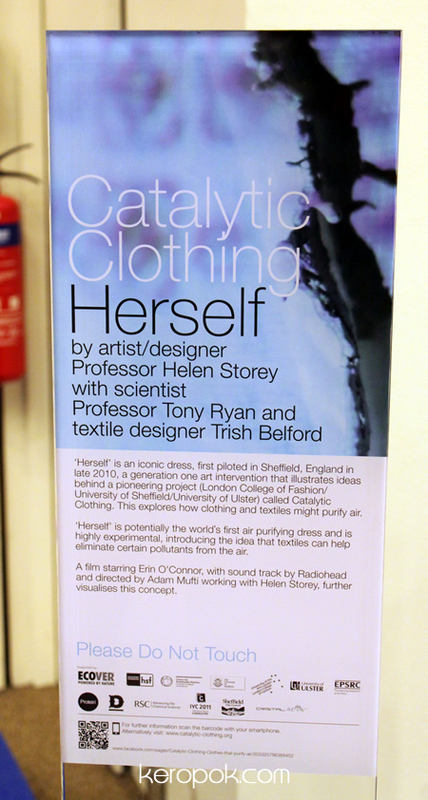 This is "Herself", potentially the world’s first air-purifying dress! The science centre 'scientist' explained to us how it works. You know cars have catalytic converters in the exhaust have catalyst that stimulates a chemical reaction to convert harmful pollutants into less toxic or inert substances. (eg hydrogen, nitrogen, oxygen, carbon dioxide). The dress has nano catalyst being part of the textile used for making the dress. The catalyst works the same way and cleans the air around it. Someone said it's a £9000 dress! Want to take a look? Head down to the Singapore Science Festival 2011! Yesterday, all the Presbyterian Church in Singapore did not hold services in their own premises. 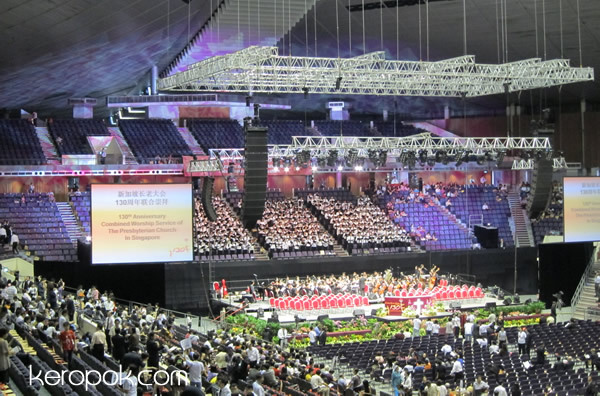 All 38 different congregation met one 'church' at the Singapore Indoor Stadium instead to celebrate the 130 years the Presbyterian Church has been in Singapore. I think probably 8500-9000 people gathered together here. It was a very unique service as both the Chinese and English speaking were together. During the singing of hymns and praises, people were either singing in English or Chinese and it sounded great! 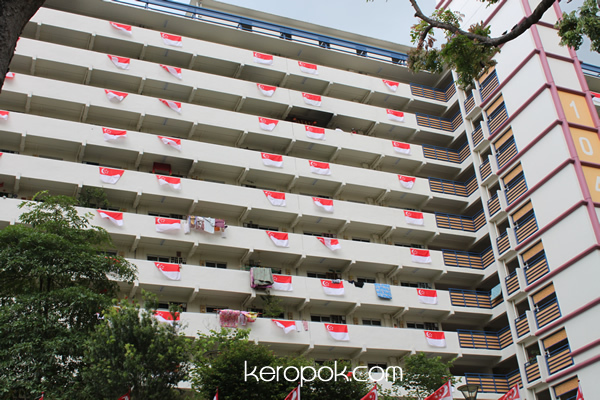 Some blocks of HDB flats are already flying the National Flag since last week. It gives such a celebratory mood doesn't it? 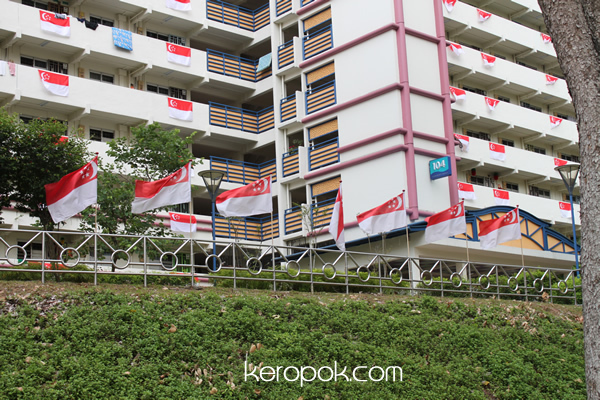 Did you know that outside the National Day celebrations period (1 Jul to 30 Sep), the Singapore flag must always be flown only from a flagpole? The Singapore Flag was unveiled on 3 Dec 1959. It was 6 months after it was self-governing within the British Empire, that it was officially adopted. Upon independence on 9 August 1965, it was adopted as the National flag. Have you seen the Singapore flag when it had the Union Jack long ago? It's like the current Australian or New Zealand flag. Hop on to this wiki link if you are interested. 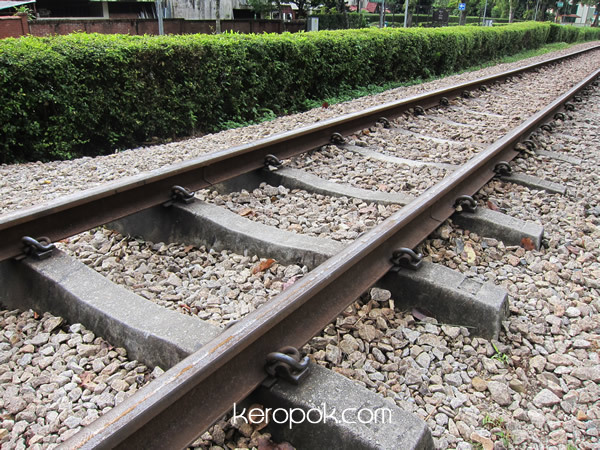 It has been a 13 days since the KTM train tracks have closed / returned to Singapore. Never have so many people got interested in something so 'old'. There is a sudden surge of people visiting the train tracks! These tracks will be gone soon. 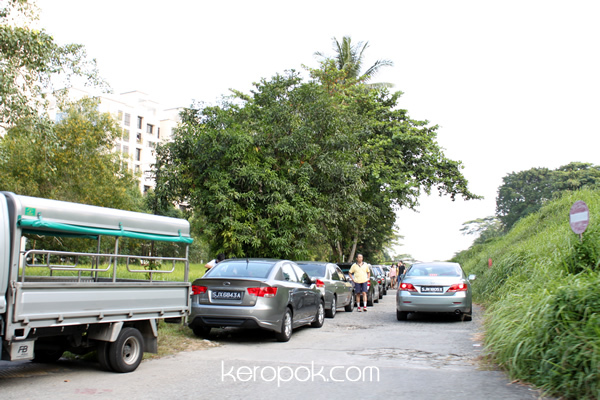 Probably in less than a month, it will all be removed by Indeco Engineers (Pte) Ltd. They won the SGD 632,000.00 Gebiz Tender to remove and storage of railway including ancillary structures from Woodlands TP to Tanjong Pagar Railway Station. This was taken yesterday morning. People are taking photos of the tracks. Others are just walking along the tracks. The tracks seems to be rusting away barely 2 weeks of not being scrapped by the wheels of the heavy trains. 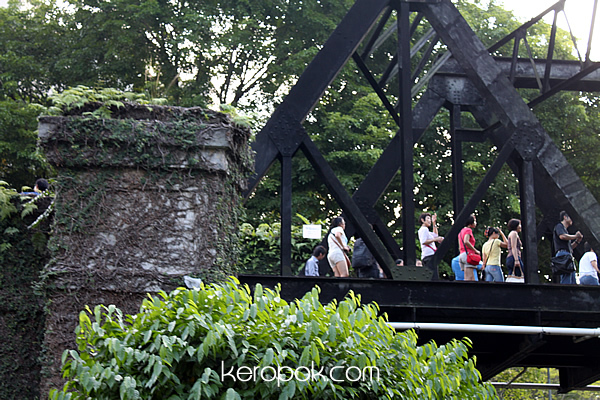 I was on my way home last Saturday and saw that there are so many people on the railway bridge! During the weekends, it's like a carnival on the tracks now! If you take public transport in Singapore during peak hours, it is difficult to get up a bus or train. 1) There are no more space in the bus because bus frequency isn't as frequent as they say it is, it is really full at the earlier stops. This morning, the bus I was on was very packed as usual. The bus driver yelled a few times for passengers to move inside, and after a few yells, people started moving in. I am so thankful for the bus drivers that yell. I managed to get up the bus because of the yelling. I stood beside the ticket issuing machine when I got up. It was too packed to move in further. 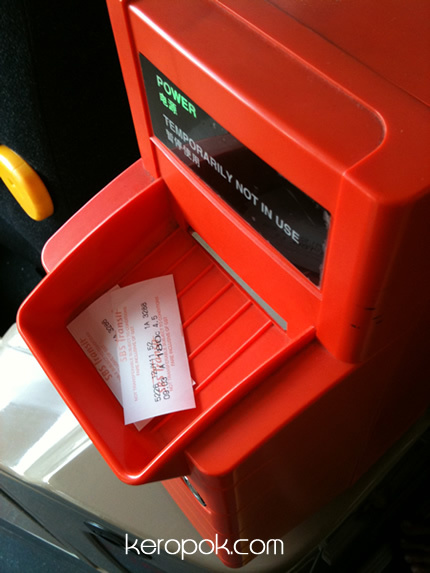 I have nothing to do so I flipped out my phone and took a photo of the ticket issuing machine. I think the colour's nice! The design's also nice ya! Practical too as it doesn't drop on the floor unlike the previous model. In a country that loves press releases, you know the words they are going to use to say they have 'no choice'. The same old excuse, escalating oil prices, productivity, cost pressures etc. The only word they did not use this time is "unprecedented"! When they say they are buying new buses, that I accept. The new buses are cleaner and more comfortable. But they seem to break down! I saw 2 new buses broke down in the last 2 weeks on my way home. Anyway, you can tell the government your views. Go to http://www.reach.com.sg they are asking members of the public to voice out. If you like reading, may I suggest the annual reports for these two companies. I like to look at buildings and take photos of them. I also like to dig out information about buildings. Phase 1 of Fusionopolis was designed by Japanese architect, Kisho Noriaki Kurokawa. I always wondered how they can think of such nice designs in the first place. Is that why an architecture degree takes such a long time to complete? Who's at Fusionopolis? A*Star, Linden Research Labs (think Second Life), Media Development Authority (MDA) and even Asian Food Channel's office! 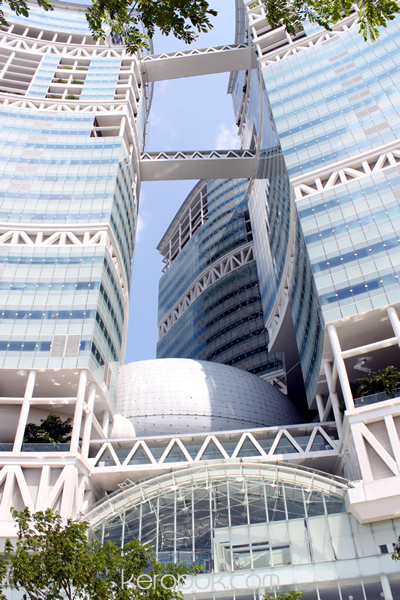 Just for your information, the architectural firm Kisho Kurokawa Architects also designed Singapore Flyer and also Wheelock Place. For some of you who thinks Wheelock Place has similarities with Melbourne Central (ie the glass cones), well, they were designed by the same architects! NUS Commencement and the Singapore President. 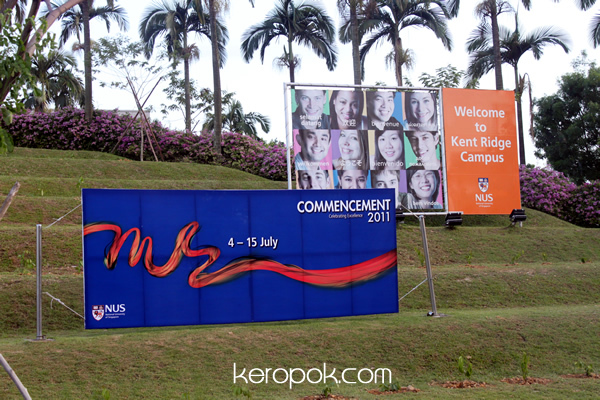 Today, it's the start of the Commencement Ceremonies for the NUS graduates again. Probably the happiest time for students, where they finally get to put on their gown and receive their scroll on stage. Not everyone loves to receive that 'piece' of paper it seems, there are always people who will skip the ceremony. I always wondered why some would do that! I have 2 degrees, one from Monash Uni down under, and a graduate degree from NUS. I don't have the brain capacity to study a PhD, and I think two is enough. Maybe one day when it becomes hip to wear the "strawberry shortcake shape" bonnet, I will reconsider. On the first day of the Commencement ceremony in NUS, the NUS Chancellor which also happens to be the President of Singapore, His Excellency Mr S R Nathan gives out the scrolls to the graduates. Since HE Mr S R Nathan would not be seeking re-election, this would be his last time giving out the scrolls. Now we are all wondering, who will be the next NUS Chancellor. Historically, the Chancellor has always been the President of Singapore. We are all guessing, but one thing for sure, the family name of the President will be 'Tan'!